So with 8 flights in 14 days having visited 3 cities, attended two major Microsoft conferences & meet hundreds of new people I can honestly say I am exhausted, inspired and slightly overwhelmed by the learning and the opportunity ahead of us. With the dust settled I have spent the last few days answering the question how was Microsoft Inspire? This is my attempt to explain what I was able to digest when such an overwhelming amount of content and people are put in front of you. Let’s start with Las Vegas and Microsoft Inspire. For those that have been to Vegas you know it is big, #MSInspire made it even bigger, the days were long, the sessions intense and I completed 20,000+ steps every day. I have recommended to Microsoft that they get a sponsor next year to provide comfy inner soles. Now we do need to break with the fabled tradition as what happened in Vegas is not staying in Vegas this time as we are desperate to tell the Microsoft story as we have experienced it, from #SatyaNadella, #GavriellaSchuster, #JudsonAlthoff, #JasonKander, #JuliaWhite and all the other amazing Microsoft employees & speakers we met, to every organisation that has the sense to listen. And yes the obligatory “Koolaid” has been consumed but rest assured we know the sugar content. As a team of people that have spent our careers working with the Microsoft products we appreciate the story told does not always match the ability to execute. For the last few years we, like many have not been able to articulate how the pieces of the Microsoft puzzle fitted together until now that is. At Inspire a well articulated and compelling offering was beautifully presented from the top down with #SatyaNadella demonstrating the #M365 suite as he uses it in his day, to the #MixedReality Field Service experience, to the future of meetings with participants joining as holograms and meeting notes and actions taken automatically using Cognitive services and AI all within #MicrosoftTeams. Then a great example of #AzureStack applications built into emergency response vehicles providing assurance of connectivity when we will most need it. And it didn’t stop there though with customers like #Carlsberg demonstrating live on stage how they are leveraging Microsoft technologies to transform/disrupt their own business. Understanding and communicating the Microsoft story to our current and future clients is one thing but to deliver on the potential is certainly another. I have come away recognising that as a Microsoft partner we have to specialise in our capabilities to ensure we can meet customer needs and adopt a partnering approach where necessary to ensure our clients are able to fully leverage/utilise the Microsoft offering. 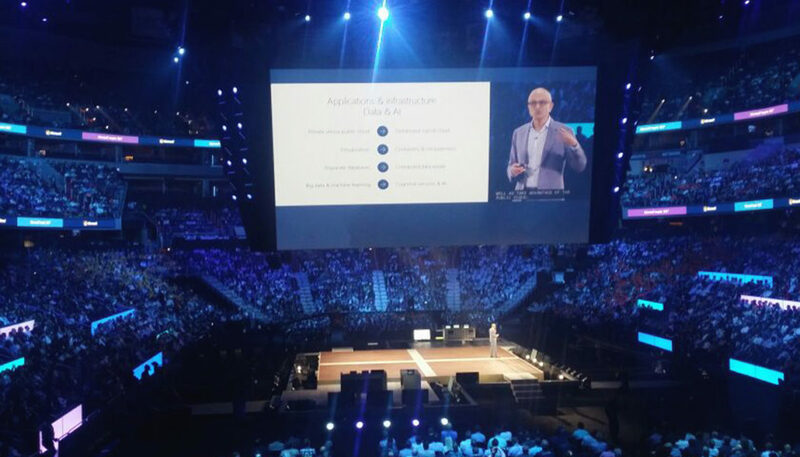 Dave Howden wrote a great summary around this following his time at #MSInspire and is well worth a read. Maturing as organisations to work collaboratively is critical and should be a criteria all customers look for when deciding on who to partner with. Next was Seattle and the inaugural Microsoft Business Software Summit (#MSBizAppSummit). Two key themes here, a unified solution based around Dynamics365 & the #PowerPlatform for extensibility. Microsoft again are pioneering the vision for what business applications should be by taking the ‘people-centre experience’ approach that Satya talked about at Inspire and bringing that into the applications that are critical to running our businesses. Think infusing #PowerBI into business transactions so that intelligent actions can be taken, extending or customising a standard workflow using #Flow to improve efficiency or automate a repetitive task and finally building a custom app with #PowerApps to deliver a better experience for a user or bringing a specific task to a specific user. Dynamics365 is a full business suite now with extensive functionality all delivered via a subscription in the cloud that is easily extendable, the introduction of a common data model (#CDM), I could go on but the message is that this is a business application platform and its huge growth should be a worry for other players in the industry. Adding in the #IoT & the #IntelligentEdge and you start to see powerful solutions in areas such as Field Service, a personal favourite of mine at both conferences was the opportunity that is available today. Now while #Walkerscott has worked extensively with PowerBI, PowerApps and Flow have in our minds resided in the Microsoft 365 domain and haven’t featured in our solutions. (note I put a small caveat here as we do use #MicrosoftFlow to make actions out of insights in PowerBI). In Seattle the clear message we have taken away is the collection of the three products that make up the Power Platform, (PowerBI, PowerApps & Flow) work seamlessly together to enable the building of intelligent solutions. This platform is all about empowering the analyst with low/no code opportunities and we saw an impressive example of this from Heathrow Airport where a security guard turn app developer significant improves business processes by leveraging PowerApps. If you then combine the Power Platform with Dynamics 365 you have the complete solution to support any business type with industry platforms extensibility out of the box. Now, in the words of Microsoft themselves it is early days but the vision is compelling and the solutions maturing fast. Segway here, it was quite funny how the Microsoft presenters themselves were frustrated by what they haven’t completed yet but when timelines were discussed it was 4 & 8 week windows… a far cry from the Microsoft of old. They are listening, developing and delivering. We will be watching this space with interest. To summarise, Inspire was the big picture showcasing the scope and scale of the Microsoft vision through presentations around the 6 key areas of the Microsoft Strategy all with #Azure as the underlying Fabric. Terms such as Intelligent cloud and the Intelligent Edge have entered my vernacular, IoT is coming fast and Microsoft are investing big, technology is here and it is up to the partners to work together to assist customers in doing great things. The Business Summit went deep into the area of Business Applications with the unified Dynamics365 solution at its core enhanced by either the citizen developer or partners using the Power Platform.